The end of May is generally a time of transition at Puttaparthi. The hot summer slowly gives away to the breezy months which announce the oncoming of the welcome monsoons. The word "soon" which constitutes a major portion of "monsoon" is significant in the sense that it seems to echo the prayers in the heart of every Prashanti resident who has bravely borne the summer heat! The nation wide an d world wide Sathya Sai Organisations too prepare for the beginning of the new calendar year which starts with the Guru Poornima celebrations due in June or July every year. And again, it is a period of transition as far as His students in the school and University are concerned. The last few days in May constitute the consummation of a fruitful stay at His lotus feet for many as they prepare to leave the portals of the University; for many others, they form the first few days of a memorable journey they are about to embark upon, a journey that will meet its beautiful end in a similar period, years hence. The morning of May 29, 2009 saw an energetic bhajan session as Swami arrived at about 9:35 a.m. granting darshan to the waiting students and devotees. 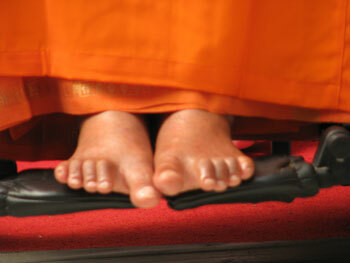 He moved to the stage where He sat for 7-8 bhajans, tapping His hands and at times His feet too! To one of the lead singers, He suddenly threw a packet of vibhuti, the holy ash. The singer, having duly completed his bhajan, moved up the marble steps to collect his packet of blessings. Then, Swami moved into the Bhajan Hall and later into the interview room. Finally, moving out again, Swami received aarthi and retired for the morning. The evening turned out to be a memorable and insightful one as Swami decided to mark the period of transition with a beautiful message for all. Swami arrived for darshan after the bhajans had begun. He took a detour after the ladies side and with a smile, moved towards the interview room. All the staff and teachers of the Higher Secondary School and the University campus at Puttaparthi were seated in the Bhajan Hall to seek His blessings before the start of the new academic year. Swami moved into the interview room apparently without even noticing them. After a while, He came out and moving through the veranda, arrived down the gentle slope which leads into the gents side of the Sai Kulwant Hall portico. The devotees who had persevered the disappointment of not having Him on their side during darshan were in for a beautiful divine gift as Swami moved through the gents side! He collected letters from many people and moved around granting darshan. Going in a direction that was opposite to the one He takes daily, Swami entered the ladies side through the path between the students' blocks. In the ladies side, He again took a detour along the teachers and staff lines to move towards the interview room. There, He created a gold chain for an old lady who seemed thrilled beyond measure at this unexpected shower of bounty! Swami waited so sweetly and patiently as the lady placed and adjusted the chain around her neck. Then He moved on, collecting letters from the members of the staff at the Anantapur campus of the University and the staff of the Sri Sathya Sai General Hospital. 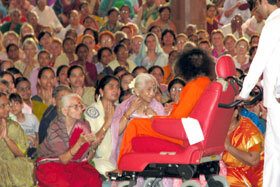 Blessing them all, Swami returned towards the interview room and almost for the next hour, there were interviews. He had passed by the door, where the teachers were seated, for about four times now and He seemed not to have taken notice of them at all.It is said that God's delays are not His denials.John Milton said, "He also serves who only stands and waits." These are the kind of quotations that flash across the mind's eye as one waits for the Lord! Waiting cleanses the mind and being of all other thoughts and feelings, and prepares one to be receptive to what the Lord has to offer. That turned out to be the case on that day too. Swami, having completed the interviews, moved gently into the Bhajan Hall. The teachers and staff rejoiced the Divine Company. Swami had a message for all. He first spoke to the to-be-appointed new warden of the Prashanti Nilayam campus, Dr. Pallav Kumar Baruah. The gist of what He said was this, "The children must be properly cared for and disciplined. What is most important is Daiva Preeti (love for God), Paapa Bheethi (fear of sin) and Sangha Neethi (morality in society). These have to cultivated in every individual. Discipline is a must, and must be strongly enforced because that is what will build fear of sin. The most important however is the first one viz. Daiva Preeti (love for God). If one inculcates Love for God, the other two automatically follow." Swami then moved literally through the length and breadth of the Bhajan Hall granting padanamaskar to all the staff, taking letters and speaking to them. Swami spoke to the teachers in small groups at various points in the Bhajan Hall but all the time, the message was exactly the same – “Love for God, fear of sin and morality in society”. It is so beautiful how the Avatar Loves us beyond measure and also takes the pain to inspire us to Love Him back with the same intensity. Swami instructing all the teachers about the mantra "Love God and Fear Sin"
For Swami, the teachers have always been the key as He believes that the only way for transformation in the world is through Educare (an education that focuses on bringing out what is latent within every individual i.e. Divinity). On that day, He spent a lot of time inspiring His teachers to mould and inspire His beloved students. In an age where the world is moving and collapsing at such a pace where one has no time to even think of the other, the Love and Guidance that Swami was pouring out selflessly was very moving. Swami's advise was like a 'farewell message' and a 'welcome note' too - an eternal, unchanging directive in the period of transition. Swami spent more than 20 minutes in the Bhajan Hall. He clarified the doubts and fulfilled the desires of many a staff but ultimately linked everything to having Love for God - Daiva Preeti. Having blessed everyone thus, Swami moved out to the stage where bhajans were on. He received aarthi after two more bhajans and then retired for the day at about 6:30 p.m. This morning, Bhagawan came for darshan while the bhajans went on, at 10.15 am. Coming onstage after a full round of the hall, He sat there for twenty minutes before accepting Arati and returning to His residence at 11 o'clock. In the evening, He sat outside after His darshan round for ten minutes while the Vedam chanting went on, and went inside just before the five o'clock bhajans commenced. Half an hour later, He emerged from the interview room to come onstage, where He sat for twenty minutes more before accepting Arati and returning to His residence. The results of the entrance examinations of the Sai University and Higher Secondary School have been announced, and the newly admitted students as well as those in higher classes will begin their classes next week. Sunday, May 24, 2009 Prasanthi Nilayam: The new week had a cool beginning as heavens sprinkled cool showers heralding the imminence of ensuing monsoon season. …And the weather has been unusually pleasant during the week, with the scorching sun simmering down giving way to cloudy skies and intermittent showers. 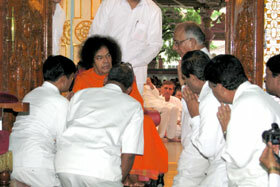 This week, Bhagawan has occasionally come for morning darshan in addition to coming to Sai Kulwant Hall in the evenings. 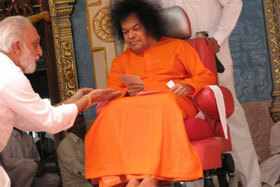 He has been interacting with some of the students, and accepting letters from devotees on His darshan rounds. This evening the baby elephant Sathya Geetha had come to Swami's residence and made her presence felt with loud trumpeting when Swami came for darshan just before five o'clock. The weather at Prasanthi Nilayam has cooled down a bit after cloudy skies and thundershowers have signalled the imminence of the monsoon rains. 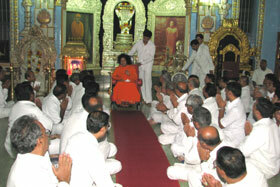 This morning, as on last Monday, Bhagawan came for morning darshan by 8.30 am. He interacted with some of the students sitting onstage for ten minutes after His darshan round before going into the interview room. In the evening, He arrived by 4.40 pm and sat for ten minutes onstage before moving to the interview room. He came back onstage as the bhajans went on, sitting there for half an hour before accepting Arati at 5.45 pm. On Tuesday also Swami had come in the morning - at 9.45 am. That evening, He called Sri Ashok Singhal of the VHP for an audience, and later blessed a student with a ring during the evening bhajans. This evening there was yet another ministerial visit - the Union Civil Aviation Minister Sri Praful Patel was here for Bhagawan's darshan. 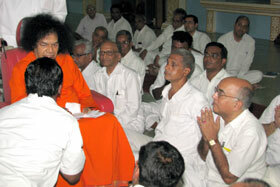 Swami came to Sai Kulwant Hall by 4.20 pm, and after His darshan round, moved to the interview room. After twenty minutes, He came onstage and sat there as the Vedam went on, interacting with some of the students. He called up the Primary School boy from Iran and asked him to chant some lines of the Vedic hymns. After twenty minutes of interaction, He returned to the interview room just as the five o'clock bhajans began. He came back onstage to accept Arati and bless Prasadam for distribution. It was six o'clock when He returned to His residence in the car. Saturday,May9,2009 his morning, Bhagawan came for darshan by 8.20 am and granted an audience for the Chief Minister of Maharashtra Sri Ashok Chavan who has been here since yesterday. In the evening, the Buddha Poornima celebrations continued. Swami arrived for darshan by 4 o'clock and moved to the interview room. From there, He asked for the Buddhist chants by the devotees to commence. 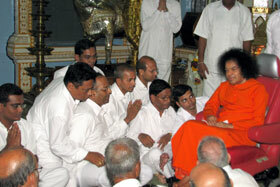 This evening, Bhagawan came from His residence at 3.50 pm. Coming straight to the Bhajan Hall, He interacted with the students dressed in costumes for the Burrakatha for nearly half an hour before moving to the interview room. At around 4.30 pm, the President of India Smt. Pratibha Patil arrived in the Mandir in her convoy. After a half-hour interaction with Bhagawan the President and her party moved out of Sai Kulwant Hall. The bhajans had begun at five o'clock. Swami came onstage at 5.15 and stopping the bhajans, began the Burrakatha performance onstage. After the 45 minute Telugu presentation on Shirdi Sai, Swami accepted Arati and left for His residence at six o'clock. This morning, the Sai Kulwant Hall was decorated and the stage had a large portrait of Mother Eswaramma as a backdrop. Bhagawan arrived at 9 o'clock in a yellow robe in the car for the Eswaramma day celebrations. Moving through the Sai Kulwant Hall as the Vedam went on, He proceeded straight to the Samadhi for a private function there with the family members and students chanting Vedam and singing bhajans. At 9.45, He returned to the Mandir and came into the bhajan hall to bless the prasadam kept there. Coming to the stage area, He sat there for a few minutes before accepting Arati at 10 o'clock and returning to His residence. Tamarind rice and sweet rice prasadam was distributed to all in Sai Kulwant Hall in leaf plates. Swami always says that joy and sorrow follow each other so closely. Devotees at Sai Shruti Kodaikanal, bid a rather tearful farewell to Swami as He boarded his chartered helicopter at 9.05 AM this morning. Back home at Prasanthi Nilayam, there was a buzz of activity to welcome Swami in about 2 hours time. Ten days of pure joy of darshan, sparshan and sambhashan for the Kodai devotees will now be followed for deep yearning to see His smiling countenance once more. At 11.15, the special aircraft touched down at Puttaparthi Airport. Agninakshatram is scorching the rocky terrain but no one seems to care. Devotees are thronging either side of the road as the motorcade passes along, drenching everyone with happiness. At the gates the boys chanting the Vedas received Bhagwan. Quickly followed up by the Bhajan Group who sang, “Swagata Shubha Vandanam, Easwaramba Priya Nanadanam…”and Bhagawan seemed to be happy to be back Home! Prasanthi Nilayam has come alive. And is fast gearing up to celebrate Easwaramma Day with Bhagwan. A day celebrated in remembrance of Bhagwan’s Divine Mother who gifted us this bundle of joy. 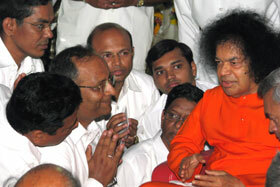 Bhagawan arrived back at Prasanthi Nilayam from Kodaikanal this morning. His flight took off from Madurai at 10.15, and an hour later He was driving to the Mandir from the airport. By 11.45, He had accepted Arati after the welcome song and poornakumbham by Vedam chanting students at the Sai Kulwant Hall and moved to His residence in the car. In the evening, as was His practice before going to Kodai, He arrived for darshan after the five o'clock bhajans began in the Hall, and sat onstage with a brief trip to the interview room before accepting Arati at 6 pm and retiring for the day.